Simulation of nitrogen (N) uptake during crop growing season is very practical in improving fertilizer management and environmental protection. It is very valuable to have a tool which can perform this simulation in a reliable way. HYDRUS-2D model has widely been used to predict the water flow and fate of nutrients in soil. However, no specific research has been conducted so far to evaluate this model in simulating uptake of different N forms (i.e., nitrate and ammonium) during crop growing season. The objectives of this study were to simulate N uptake and transport under furrows and ridges during the maize growth period using HYDRUS-2D model under different N stresses. Thus, maize was planted with different application rates of urea including 0, 150 and 250 kg N ha−1 over 2015 and 2016 growing seasons. Data from the first and second seasons were applied to calibrate and validate model parameters, respectively. The N uptake, soil water content and nitrate and ammonium concentrations in different depths under furrows and ridges were measured during both seasons. 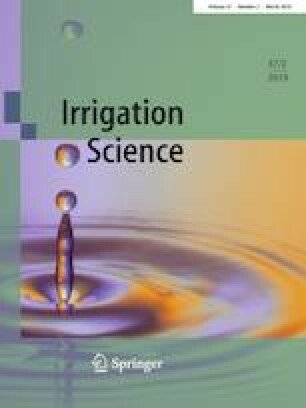 Results indicated appropriate agreement between predicted and measured water content, nitrate and ammonium distribution in soil during the validation stage. The ranges of the normalized root mean square error (NRMSE) for nitrate and ammonium concentrations in soil for all treatments were about 22.28 to 23.36% and 17.06 to 24.79% that implies a fair accuracy of HYDRUS-2D model. In spite of appropriate accuracy in estimating total N uptake at harvest time, the model was not capable to simulate accumulated N uptake with high accuracy (13.82 ≤ NRMSE ≤ 29.53) during the growth periods. Consequently, ignoring some processes such as the active uptake to simplify the simulation caused the model to underestimate N uptake rate during the vegetative stage when the maize reaches its maximum growth rate. In addition, the N uptake was simulated more accurately in the absence of N stress.